Comments: Substituting for the Patrol Leader is only part of the Assistant Patrol Leader’s job. The APL actively helps run the patrol. Attendance: Set the example by being an active Scout. Be on time for meetings and activities. You must call the Patrol Leader or Scoutmaster if you are not going to be at a meeting or if you suddenly have to miss an outing. You also need to make sure that someone will assume your responsibilities. This requires you to “Be Prepared”, plan ahead and this will never be an issue. Must be well informed in case Patrol Leader is absent. Planning and leading patrol meetings and activities. Keeping the patrol members informed. Preparing your patrol to take part in Troop activities. Assist your patrol leader by following through on assigned duties. Make sure you know what is going on so you can help out. Know what the Patrol Leader is supposed to do and fill in for him when he is absent. Represent the patrol at the PLC in the absence of the Patrol Leader. In the absence of your Patrol Leader, represent and vote for your patrol at the PLC. Attend at LEAST two PLC meetings with the patrol leader present to learn the process and procedures. Have skits ready for outing campfires. Have cheers ready for outing campfires. Have songs ready for outing campfires. 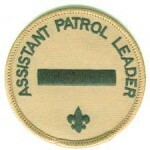 Assist troop chaplain in Scout Own Service during outings when necessary. Call the patrol members each week to check they are following up on their assignments and communicate program information. Be sure to let your APL know if you are going to be absent so he can fill in for you. Make sure he knows what is supposed to happen and what responsibilities the patrol has. Have fun but not at the expense of everyone. Goofing off without purpose wastes time and loses the interest and respect of the other scouts.